While Opera Cake may not be the most widely recognized offering in the pastry shop display case, it is a well-loved slice of layered decadence for those in the know. With thin stacks of Coffee Soaked Sponge Cake, Coffee Buttercream, Chocolate Ganache and a Chocolate Glaze, there is a lot of taste and texture to be found in just one place. 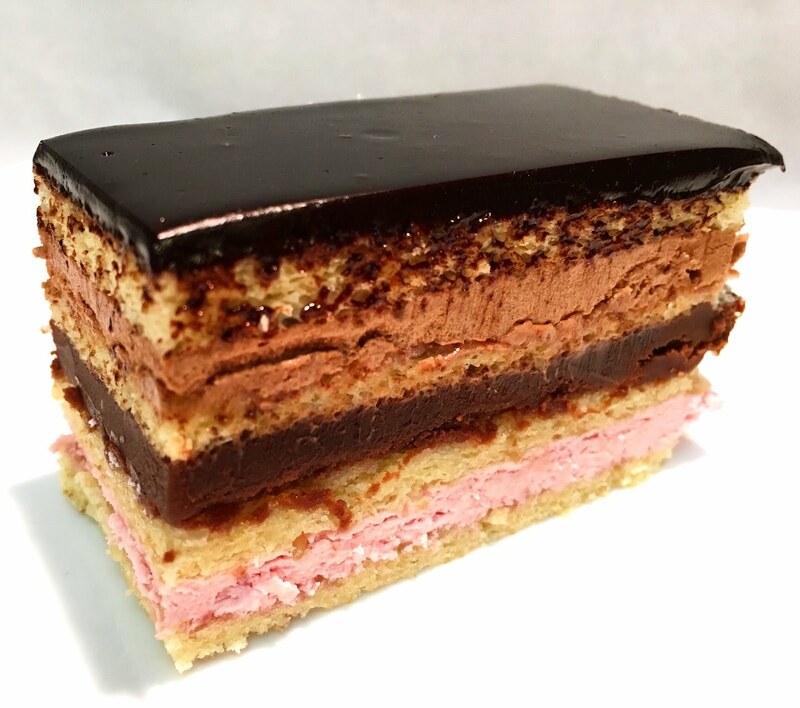 While the traditional flavor profile of an Opera Cake is Coffee and Chocolate, the layered format can be adopted and filled with any flavors. So for this night at the opera, I decided to go rock and roll: Raspberry soaked Sponge Cake layered with Raspberry Buttercream, Chocolate Peanut Butter Ganache, Chocolate Buttercream and a Chocolate Glaze. Yes... I added a layer to the stack! It's easiest to tackle this Rock Opera Cake in two stages. The first stage is preparing all of the components: Jaconde (Almond Sponge Cake), Raspberry Soak, Raspberry Buttercream, Chocolate Buttercream, Chocolate Peanut Butter Ganache and Chocolate Glaze. The components keep well and are ready to use with limited additional prep once they temper. The second stage is putting it all together. While assembling the Rock Opera Cake, it can be helpful to use the refrigerator to chill and set the layers as you work. As a result, it is best to work on a sheet tray that can easily be moved in and out of the refrigerator. The Raspberry Soak is intended to add some moisture and flavor to the Jaconde. It should not saturate the Cake. Each layer should be of the same thickness, so take the time to make smooth and even layers. Do not worry about having clean edges (although don't make an unnecessary mess). The Rock Opera Cake will be trimmed after it is glazed. It is then portioned into individual servings. 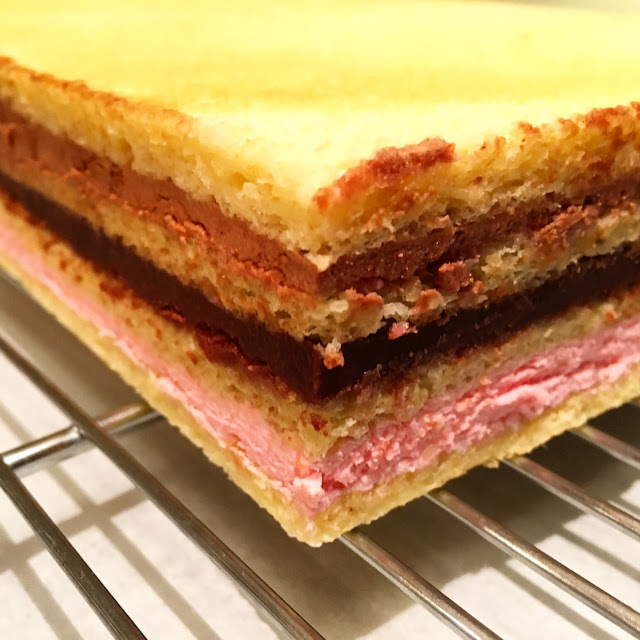 When all of the layers are assembled, chill the Rock Opera Cake before covering it with the Chocolate Glaze. This ensures that the layers are solid and helps the Chocolate Glaze to set faster. When cutting the Rock Opera Cake, use a clean knife that is rinsed and dried between each cut. This ensures that the sides of the Rock Opera Cake clearly highlight all of the layers inside without any streaks. 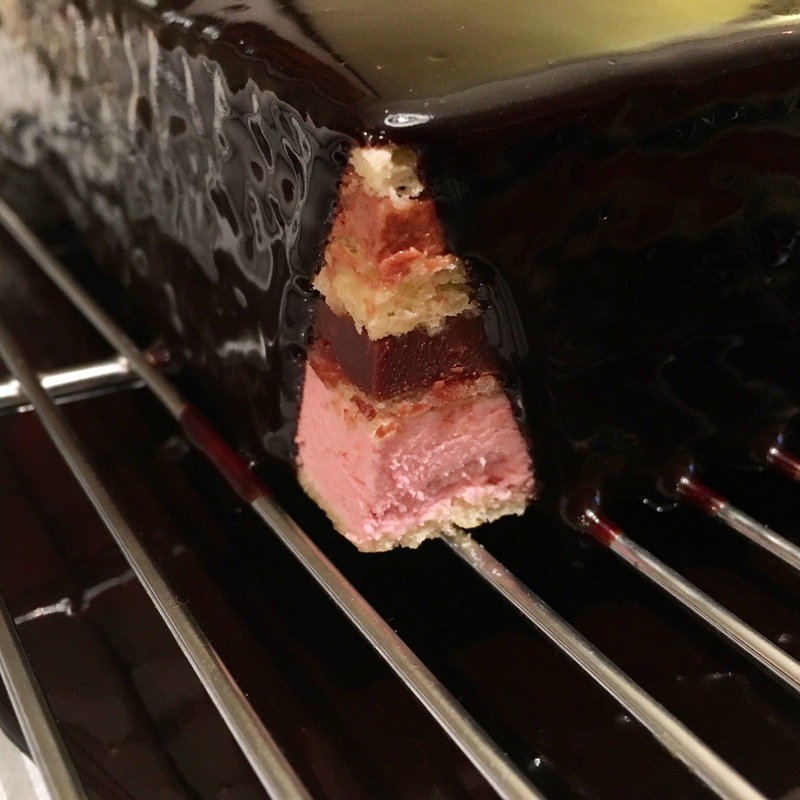 The assembled but unglazed Rock Opera Cake can be refrigerated for a week or frozen for up to a month wrapped well in plastic wrap. 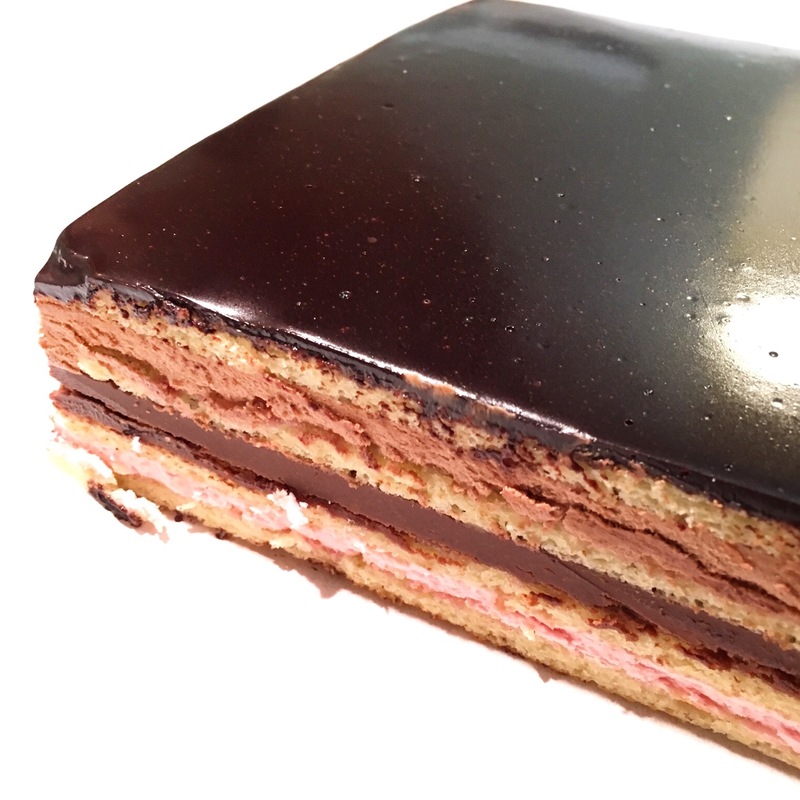 A refrigerated or frozen Rock Opera Cake should be tempered to room temperature before serving. It is best to glaze the Rock Opera Cake the day it will be served for a smooth and shiny finish. Opera Cake is traditionally displayed whole with a shiny glazed top. Individual slices are then carefully cut to showcase the delicate layers within. *Note on ingredients: You should be able to make 100g of Raspberry Puree from 150g (5 oz) of fresh or frozen Raspberries. *Note on ingredients: You should be able to make 180g of Raspberry Puree from 240g (8 oz) of fresh or frozen Raspberries. 1. Preheat the oven to 375 degrees Fahrenheit (191 degrees Celsius). Line two half sheet trays (18" x 13") with parchment or a silpat and gently spray the sheet trays with non-stick spray. Allow the Eggs to temper to room temperature. Melt the Butter and set it aside to cool. Sift together the Almond Flour, All Purpose Flour and Salt. 2. Place the Flour mixture and 75g of Sugar in the bowl of an electric mixer fitted with a paddle attachment. With the mixer on medium speed, add the Whole Eggs one at a time. When all of the Whole Eggs have been added, increase the mixer speed and beat the batter until it is light and fluffy - approximately three minutes. Set the batter aside. 3. In a clean mixer bowl, prepare a French Meringue with the Egg Whites and 125g Sugar. Whip the Meringue to medium-stiff peaks. 4. Lighten the batter with some of the Meringue, then fold half of the lightened batter into the Meringue. While the mixture is still streaky, fold in the remaining lightened batter. 5. Lighten the melted Butter with some of the batter. Fold the lightened melted Butter into the batter. 6. Divide the Jaconde batter into two equal portions and gently pour it onto the prepared sheet trays. Spread the Jaconde batter in a thin, even layer being careful not to deflate the batter. 7. Immediately place the sheet trays in the oven and bake the Jaconde for approximately 8-12 minutes, rotating the sheet trays half way through baking time. The baked Jaconde should just begin to brown and should spring back at the touch. 8. 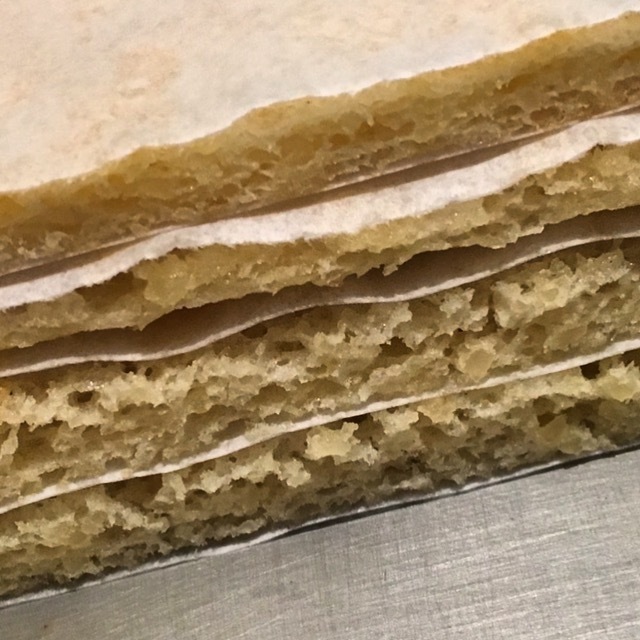 Immediately remove the baked Jaconde from the hot sheet trays and transfer them to cool sheet trays lined with parchment paper or a wire cooling rack. Chef's Note: With a thin, delicate Cake such as this, it is important to remove it from the heat as soon as possible to prevent over-baking. Storage: The Jaconde can be made several days in advance and stored in the refrigerator wrapped in plastic wrap. 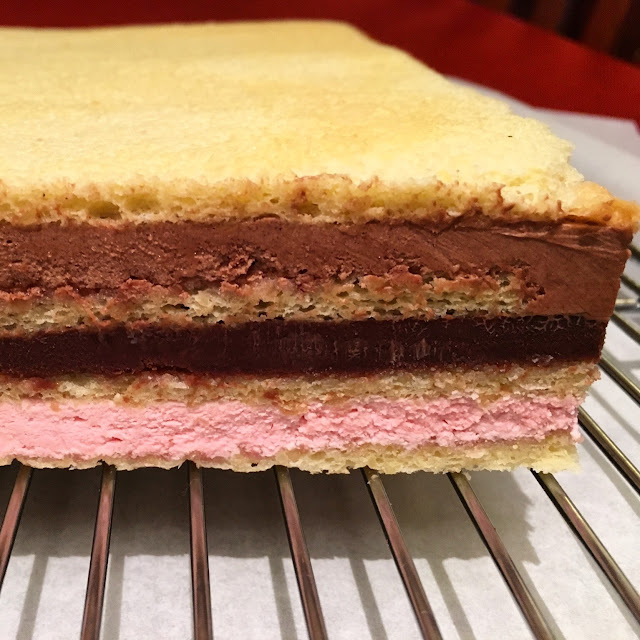 Allow the Jaconde to temper to room temperature before assembling the Opera Cake or it will not absorb any of the Raspberry Soak. 1. Combine the Sugar and Water in a medium pot and bring the mixture to a boil. When the Simple Syrup begins to boil and the Sugar is fully dissolved, remove the pot from the heat and set it aside to cool slightly. 2. Pour the Simple Syrup into the Raspberry Puree and stir the mixture until it is well combined. Storage: The Raspberry Soak can be made in advance and will keep for up to a week stored in an airtight container in the refrigerator. 1. Prepare one full recipe (1,000g) of Italian Buttercream Frosting. Divide the Buttercream between two bowls. 2. For the Chocolate Buttercream, gently heat the Semi-Sweet Chocolate over a double boiler until it is just melted. As the Semi-Sweet Chocolate melts, place the reserved Buttercream Frosting (500g) in a clean mixer bowl. While beating on medium speed, pour all of the melted Semi-Sweet Chocolate into the mixer bowl. When the Semi-Sweet Chocolate is mostly incorporated, increase the mixer speed to high and continue beating until the Chocolate Buttercream Frosting is smooth and homogeneous. 3. For the Raspberry Buttercream, puree Raspberries and pass the Raspberry Puree through a fine mesh sieve to remove the seeds. Place the reserved Buttercream Frosting (500g) in a clean mixer bowl. While beating on medium speed, slowly stream the strained Raspberry Puree into the mixer bowl. When the Raspberry Puree is mostly incorporated, increase the mixer speed to high and continue beating until the Raspberry Buttercream Frosting is smooth and homogeneous. Storage: The Italian Buttercream Frostings can be made in advance and stored in the refrigerator for several weeks or frozen for several months. Before using Italian Buttercream that has been refrigerated or frozen, allow it to temper to room temperature and then beat it smooth in an electric mixer fitted with a paddle attachment. 1. Finely chop the Chocolate and place it in a bowl over a double boiler. Add the Peanut Butter. Gently heat the Chocolate and Peanut Butter mixture until the Chocolate begins to melt. At the same time, heat the Heavy Cream to a gentle simmer. Pour the warm Cream over the Chocolate and Peanut Butter mixture and allow the Chocolate to melt for several minutes. 2. After several minutes, emulsify the mixture. Using a wooden spoon or spatula, begin by stirring in small circles at the center of the bowl, slowly working outwards as the ingredients come together. Continue stirring until the mixture is completely combined. If some of the Chocolate is not entirely melted, the bowl can be returned to the double boiler and gently heated while actively stirring. 3. Set the Chocolate Peanut Butter Ganache aside for at least 30 minutes, stirring occasionally as it cools and sets. Chef's Note: For more information, read this detailed post on preparing Ganache. Storage: The Chocolate Peanut Butter Ganache can be made several days in advance. If you will not be assembling the Opera Cake within two days of making the Chocolate Peanut Butter Ganache, it is best to store it in an airtight container in the refrigerator. Chocolate Peanut Butter Ganache that has been refrigerated will become hard. Before using the Chocolate Peanut Butter Ganache, allow it to temper to room temperature or gently warm it in a warm water bath or over a double boiler. Once the Chocolate Peanut Butter Ganache is soft and spreadable, mix it smooth with a hand blender, spatula or wooden spoon. 1. Place the Gelatin Sheets in a bowl of cold water to bloom. 2. Combine the Sugar, Cocoa Powder, Salt, Water and Cream in a medium pot. Heat the mixture to a boil while whisking constantly. When the mixture come to a boil and the Sugar is fully dissolved, remove the pot from the heat. Add the Chocolate to the pot while stirring. Continue stirring until the Chocolate is fully melted and well incorporated. 3. Remove the bloomed Gelatin Sheets from the cold water and squeeze out any excess water. Add the Gelatin Sheets to the pot while stirring. Continue stirring until the Gelatin Sheets are fully dissolved. 4. Pass the Glaze through a fine mesh sieve to remove any undissolved Gelatin, Chocolate or Cocoa Powder. Transfer the Glaze to a clean bowl and cover it with plastic wrap directly on the surface. Place the bowl over an ice bath to cool and then transfer the Glaze to the refrigerator to set for at least four hours before using. Storage: The Chocolate Glaze should be made in advance and will keep well for several weeks when stored in an airtight container in the refrigerator. Before using the Chocolate Glaze, heat it gently in a warm water bath or over a double boiler until it is just liquid enough to pour smoothly over the Opera Cake. 1. 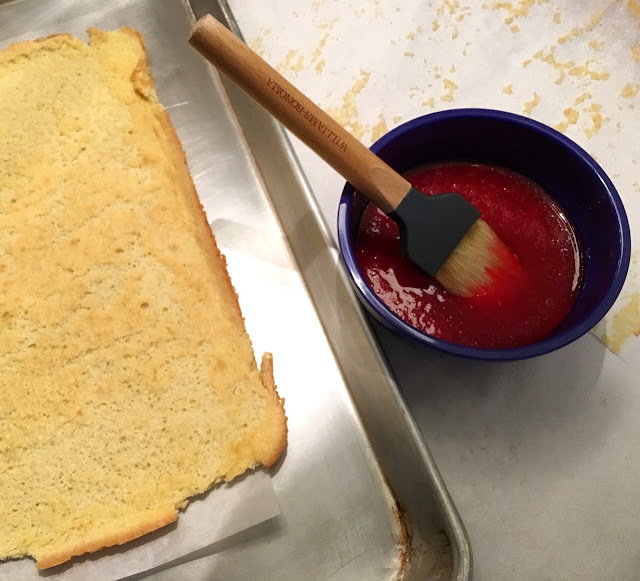 Cut both sheets of Jaconde in half making four 9"x13" sheets of Cake (i.e. quarter sheet tray size). 2. Place the first sheet of Cake on a parchment lined sheet tray that can easily be transferred to the refrigerator to chill as you work. Lightly brush the first layer of Cake with the Raspberry Soak. Do not saturate the Cake - you will not use all of the Raspberry Soak. When the Raspberry Soak is mostly absorbed, cover the Cake with an even, 1/4" layer of the Raspberry Buttercream. 3. 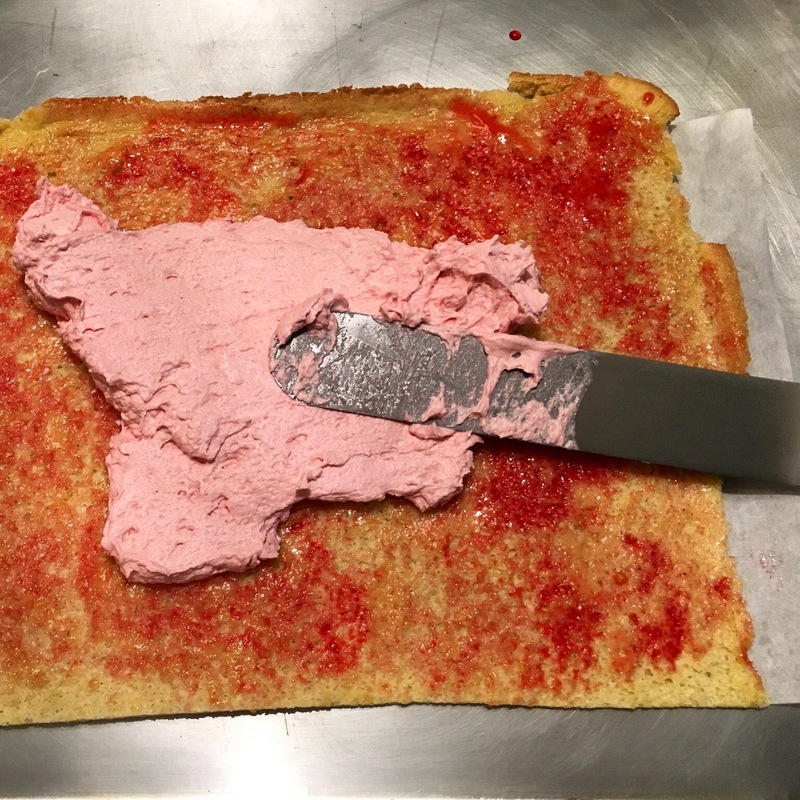 Place the second sheet of Jaconde on top of the Raspberry Buttercream and press gently to begin the second layer. Lightly brush the second layer of Cake with the Raspberry Soak. 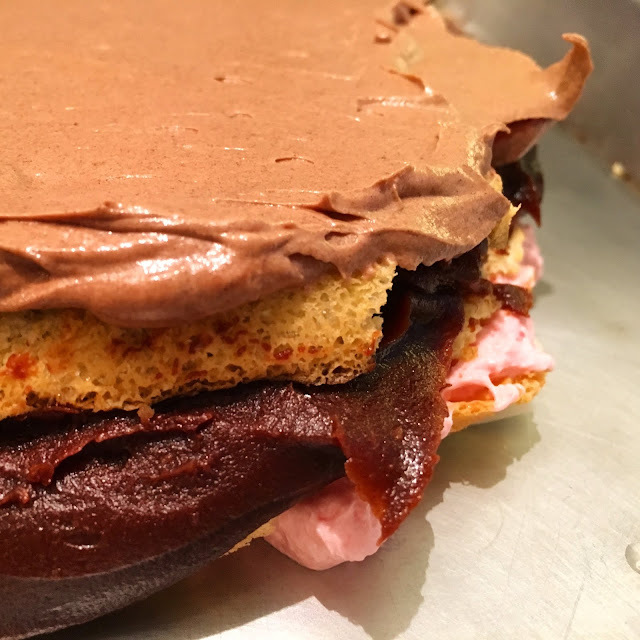 When the Raspberry Soak is mostly absorbed, cover the Cake with an even, 1/4" layer of the Chocolate Peanut Butter Ganache. 4. Place the third sheet of Jaconde on top of the Chocolate Peanut Butter Ganache and press gently to begin the third layer. Lightly brush the third layer of Cake with the Raspberry Soak. When the Raspberry Soak is mostly absorbed, cover the Cake with an even, 1/4" layer of the Chocolate Buttercream. 5. Place the fourth and final sheet of Jaconde on top of the Chocolate Buttercream and press gently to begin the fourth and final layer. Lightly brush the fourth layer of Cake with the Raspberry Soak. Cover the Cake in plastic wrap and place it in the refrigerator to set - at least 30 minutes. 6. While the Cake chills, reheat the Chocolate Glaze. Once the Cake has set and the Glaze is of the desired consistency, remove the Cake from the refrigerator. Transfer the chilled Cake to a wire cooling rack placed over a parchment lined or plastic wrapped sheet tray. This will catch the excess Chocolate Glaze, which can be reused. Pour the Glaze in a single, smooth and even layer on top of the Cake. If necessary, smooth the Chocolate Glaze with an offset spatula, working quickly before it sets and the spatula leaves marks. (Return the Cake to the refrigerator while the Glaze sets. The individual components for the Cake can be prepared in advance with final assembly occurring later. - The Jaconde can be wrapped in plastic and refrigerated for up to a week or frozen for a month. A refrigerated or frozen Jaconde should be allowed to fully temper to room temperature while still wrapped in plastic before it is used. - The Raspberry Soak can be made in advance and will keep for up to a week stored in an airtight container in the refrigerator. - Italian Buttercream can be refrigerated for a couple weeks and frozen for several months. Before using Italian Buttercream that has been refrigerated or frozen, allow it to temper to room temperature and then beat it smooth in an electric mixer fitted with a paddle attachment. - The Chocolate Peanut Butter Ganache can be made several days in advance. If you will not be assembling the Opera Cake within two days of making the Chocolate Peanut Butter Ganache, it is best to store it in an airtight container in the refrigerator. Chocolate Peanut Butter Ganache that has been refrigerated will become hard. Before using the Chocolate Peanut Butter Ganache, allow it to temper to room temperature or gently warm it in a warm water bath or over a double boiler. Once the Chocolate Peanut Butter Ganache is soft and spreadable, mix it smooth with a hand blender, spatula or wooden spoon. - The Chocolate Glaze should be made in advance and will keep well for several weeks when stored in an airtight container in the refrigerator. Before using the Chocolate Glaze, heat it gently in a warm water bath or over a double boiler until it is just liquid enough to pour smoothly over the Opera Cake. - The assembled but unglazed Opera Cake can be refrigerated for a week or frozen for up to a month wrapped well in plastic wrap. It is best to glaze the Opera Cake the day it will be served for the best finish. - A refrigerated or frozen Opera Cake should be tempered to room temperature before serving.